Why do so many capitals of culture run into problems? 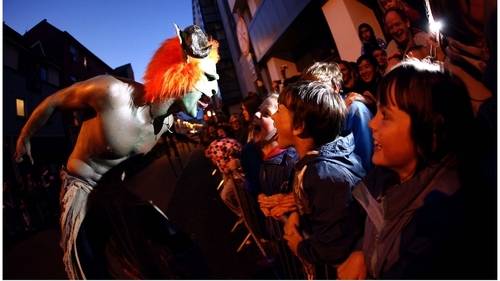 Will Macnas street theatre rescue the show for Galway 2020? In 2013, the streets of the city of Marseille were filled with sheep, horses and cattle. The animals filled the streets with bells and noise and people lined the streets to watch them go past. This mass movement of livestock from one grazing ground to another in a seasonal cycle is an age-old process, known as Transhumance. Marseille, which was European Capital of Culture in 2013, made this one of its signature events, in a joyful and meaningful celebration of nature and of agriculture. We often hear about the problems with the European Capital of Culture project, but it is worth remembering what it does really well. It has the potential to focus a spotlight on some of the cultural and artistic practices that define us as people, and to allow them to be seen in a new light. This is certainly what Galway will be planning to do when they are the designated Capital of Culture in 2020, sharing the year with Rijeka in Croatia. But as recent media coverage of tensions and key staff departures within the Galway2020 demonstrate, the experience of being the designated Capital of Culture does not always run smoothly. Creative director, Chris Baldwin and chief executive, Hannah Kiely have stepped down and been replaced, and key partner organisations have expressed worries as a result about budgets, delays and a lack of information. Though the specific experience within each capital will be different - and will unfold according to the local structures in place - it is possible to explore why this designation can be problematic and even disruptive. Galway is a city known for delivering high-quality and internationally-renowned arts events, given that it is home to world-class performance companies like Macnas, Druid Theatre (which announced it was withdrawing a major production from Galway 2020 due to budget and communication issues) and the long-established and successful Galway International Arts Festival. It is, therefore, a city with significant arts experience and expertise. However, the weight of expectations and competing priorities that come with the European City of Culture can bring problems to even a well-established artistic and arts management community. Of course, this experience can also be replicated on a national rather than European scale. When Limerick hosted the first National City of Culture in 2014, similar issues arose, with key members of the artistic and delivery team stepping down following tensions with the board about the delivery of key programme plans. In the end, an excellent team drawn from the Limerick City and County Council Arts Office and the Limerick School of Art and Design delivered on those original programming ideas. The visit of the Giant Granny by Nantes-based Theatre Company Royal De Luxe, was one of the most successful cultural events that the city has ever seen. While the vision of the original team, and the work of the team that delivered the events, were honoured by a Judge’s Special Award at the Irish Times Theatre Awards in 2015, the impact on individuals of such fall-out, changes and tensions should not be underestimated. Successful and visionary festival development requires skill, insight and extensive experience, and the original work of programme creation should be recognised. After all, this vision and skill are what makes these events unique and iconic, remembered and talked about for years after they have taken place. So, why can the European Capital of Culture lead to such problems? An overview of the history of the programme itself provides some insight. The first Capital of Culture programme took place in Athens in 1985, and the initial years focused on cities with a well-established reputation as cultural centres, including Florence (1986), Amsterdam (1987) and Paris (1989). The designation of Glasgow as European Capital of Culture in 1990 is usually seen by researchers a signalling a change in direction. In Glasgow, the Capital of Culture designation was supposed to do more than just celebrate what was already there - it was supposed to be transformative. It was supposed to shine a new light on a place that had perhaps been overshadowed by places like Paris and Berlin. It would inject new life into a post-industrial city, invigorating the experience economy and driving cultural tourism to the region. This shift from celebration to transformation reflects a more general change in public policy to do with arts and culture around this period. As well as highlighting and celebrating the local arts and culture, and creating new opportunities for artists and audiences through inspired programming, culture now has other aims. It has to create jobs and increase city centre footfall and bed nights in hotels. It has to transform the public image of a city and region into a recognised cultural hot-spot. It has to deliver on a host of other promises, including increased social cohesion, reduced social problems and better health outcomes. Done well, resourced properly and managed effectively, arts and culture can actually deliver on many of these promises and expectations. However, it can’t do it all at once and it won’t happen in a rush. Many artists, arts managers and researchers also argue that, while these are fantastic possible benefits and outcomes, the main emphasis should remain on the artist and the experiences of audiences, rather than on these secondary outcomes. The British artist Grayson Perry summed up this predicament perfectly with one of his sculpted pots, emblazoned with the words "This Pot Will Reduce Crime By 29%"
It is possible to understand why policy makers and politicians find it easier to argue for investment in arts and culture along these lines in an age of homelessness, cuts and catastrophic hospital waiting lists. When dealing with public money and public accountability, this is seen to be better than focusing on shared cultural experience, the importance of artistic expression and investigation, and the need for trial, error and time within artistic processes. This tension between the intrinsic and instrumentalist values of arts and culture is ever-present. It will be well-known to all those involved in filling in funding applications, running artistic institutions or managing cultural programmes. In the context of the European Capital of Culture, however, this tension is intensified. The budgets are far greater, and the stakes are far higher, as highlighted by Dr Beatriz Garcia and others. The bid books, prepared by each potential city, tend to promise transformative impacts for the city and region, a huge return on investment and a meaningful legacy that will return dividends for years to come. While the delivery teams for the European Capital of Culture work together for a number of years leading up to the actual delivery of the events, the management of such a high-profile, and high-expectation event requires a serious investment in trust. Board members need to trust the artistic vision and expertise of programmers, while programmers and members of the artistic team need to trust and listen to the concerns of board members, who are tasked with managing those expectations outlined in the bid books. It's also worth noting that while the designated Capital of Culture city receives both European and national funding to support the programme, there is a huge budget shortfall that they must raise themselves. Despite our much-vaunted national image as a country defined by culture and the arts, we are among the lowest within the EU in terms of investment per head in the sector. The sector is underfunded as it stands, with many cultural organisations relying on volunteers and unpaid interns to carry out basic functions. The 2016 Irish Museum Association survey of the sector led by Dr Emily Mark-Fitzgerald clearly demonstrated that many arts organisations struggle to maintain their buildings. While organisations like Business to Arts work well to support partnerships between corporations and arts organisations, Ireland tends to rely on public rather than private funding models. This means that the task of fundraising and securing the necessary budget poses an immediate concern for any Capital of Culture management team, as UL academic Dr Annmarie Ryan has explored in her research on this subject. Most of all, however, the whole delivery team need to trust and listen to their communities, who will be best placed to really articulate and shine a light on the cultural and artistic riches of their environment. Sometimes, the tensions that emerge can lead to positive outcomes. In Limerick 2014, it led to hundreds of citizens turning up to a public meeting to voice their concerns and their own vision, expressing a desire to take ownership and resulting in some of the most successful projects throughout the year. When caught early and managed effectively, tension can actually bring people together and lead to a better and more inclusive outcome. The reason why the European Capital of Culture programme is valuable is because it allows us to see, celebrate and explore difference, and the rich variety across the member states. It should avoid replicating spectacular but generic events that would, in the end, look the same in Valetta, Cork or Riga, and trust that what we have is worth celebrating, lifting up and being proud of. Summer festivals: a queue for a portaloo or a play at revolution?